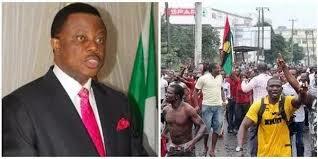 The alcoholic addict and gangster Willie Obiano, a man who always drank himself to stupor which often result to a show of shame and disgrace both within Anambra State and beyond was recently quoted as saying "Biafrans are toothless bulldogs incapable of actions", this is not surprising coming from an Hausa-Fulani slave who does not know that such careless comment is capable of inciting violence. Usually, the irrational words of drunkards are easily overlooked by people, but that of a top government official in the capacity of a governor and chief security officer of a state, even though as a recognized professional alcoholic, can never be swallowed without counter reaction. Perhaps the world needs to be reminded of how Obiano got to where he is today. It is on record that Biafrans campaigned and voted massively for Willie Obiano to the office of the governor of Anambra state. But it is highly regrettable that Willie Obiano has decided to be swimming in the pool of blood of the innocent Biafrans that voted him into office. Willie Obiano stated that "Nigeria is invisible" and in his bid to keep the expired Nigeria state as one, he did not hesitate to murder the same Biafrans that voted him into power. This murderer Willie Obiano slaughtered Biafra protesters en masse in Anambra state, the highest record of killings compared to every other state where Biafrans protested. Recall in August 30 2015, Willie Obiano ordered the shooting of unarmed Biafrans who went on evangelization mission of the message of freedom for Biafra along Head Bridge, Onitsha, after having their usual meetings. So many of the Indigenous People of Biafra (IPOB) were gunned down by Obiano's goons without any form of provocation. The brutalization of Biafrans continued unabated in every gathering they attended in Anambra state under the command of Willie Obiano. May 30th, 2016, which every Biafrans were to remember our fallen heroes without fail was no exception, as Willie Obiano under the supervision and order of tyrant Buhari desecrated the memory of our heroes and even added more numbers to the dead who were being remembered on that fateful day by killing them mercilessly. These Obiano killers shot directly at the people at the venue of the event, killing as many Biafrans as their live ammunition could hit, having earlier mowed down all those attending a night vigil prayer at St Edmund's Catholic church on the eve of the occasion. It was the greatest massacre recorded in the history of the restoration of Biafra, ordered by Buhari in conjunction with Obiano and carried out by the Nigerian army. It's so sad and heartbreaking that Biafrans from different cities who stormed Nkpor to honor/celebrate their heroes and heroines, went back home with more fallen heroes. A very sad day that IPOB will never forget. Obiano After the genocide at Nkpor, instructed a thorough search at various hospitals located at Onitsha where the injured Biafrans were taken to. He (Obiano) made away with these wounded innocent citizens who were bleeding and gnashing their teeth in pain to an undisclosed location. Till date, the whereabout of these injured Biafra citizens hijacked by heartless drunkard, Willie Obiano is yet to be known. IPOB being a lawful society, despite all of these have continued to maintain a peaceful approach in their agitation for Biafra restoration. We have remained resilient, calm, unprovoked despite being harassed, detained, teargassed, killed, maimed, injured by Willie Obiano/Buhari-led administration in Nigeria. Biafrans instead of carrying out reprisal attacks, chose to go about it in a civilized manner and in accordance with the dictates of the law and constitution, telling the world, with pictures and videos of the evil Biafrans are passing through as showcased in the just concluded Biafra Genocide Exhibition in Vitoria, Spain. Our gentility, calmness and meekness in this quest for the restoration of Biafra should never be undermined or misinterpreted as cowardice; the only reason why we are keeping calm is because of our unique nature and value of human lives as we believe that every human life is sacred. The Indigenous People of Biafra are not toothless bulldogs but law abiding citizens. Willie Obiano must be delusional to think we will be provoked into being violent, he is only looking for more reason to kill Biafrans but alas, his plans have failed. During Biafra/Nigeria war of 1967, Biafrans, even without sophisticated weapons defended their land from the Nigerian invaders and their allies, both on land, sea and aerially. The war, according to the Nigerian Army was supposed to last for just one month and Biafraland will be conquered and overrun by the Nigerian forces, but surprisingly, the war raged on from the stipulated one month to three solid years. Biafrans are not weaklings, they are ever ready to claim their land when violence becomes the last option, but until that time, we shall remain law abiding. But if the only option given to IPOB remains violence at the end of the day, then the world should be ready to accomodate millions of refugees, the highest of its kind compared to the Syrians who are still waiting at their border to seek refuge. I want to end this piece of mine by asking this question, when aggrieved Biafrans rise up, where will Willie Obiano run to? Don't regard the comments of a drunk, he must be acting under influence of alcohol.